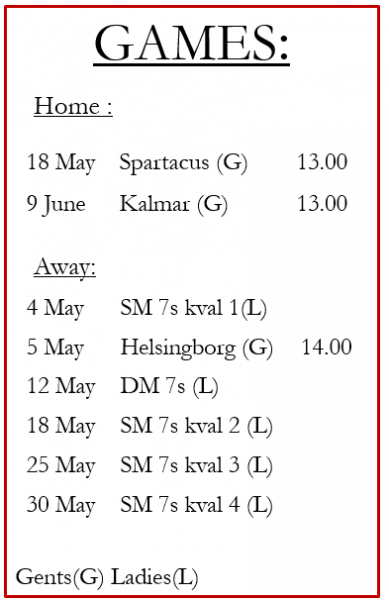 Now when spring is finally in the air Pingvin Rugby Club has sent out their invitations for their Easter tournament. 15s for the men and 10s for the ladies. Games on Friday the 2nd of April and playoffs and finals on Saturday, ending with a banquet at 7pm. The fee for the mens is 2500sek and for the ladies 1500sek and includes 20 / 12 banquet tickets. If interested talk to Old Stefan or ladies-Stefan on training at 8pm Tuesdays and Thursdays. It is usually a great tournament so don´t miss out on the fun! Nice turnout for the guys at practice, Stefan Landgren seemed to have been able to shake some speed out of the team, looking promising for the season! Stefan T had the girls running the idiot, running backwards, running sideways, running fast, running together and eventually jogging down. The reward was some nice backline moves and water. It was a fun and organized first training, great to see everone again, and you who missed out, be sure to come next week. This entry was posted in Management, Men's Team, Women's Team on January 14, 2010 by admin.